We’d love your help. 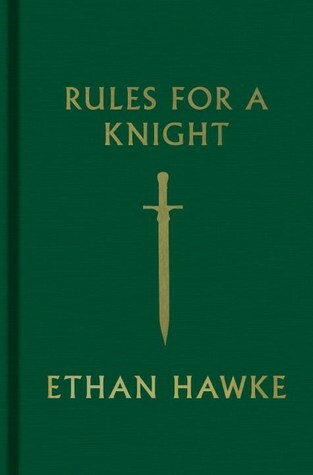 Let us know what’s wrong with this preview of Rules for a Knight by Ethan Hawke. From Ethan Hawke, four-time Academy Award nominee—twice for writing and twice for acting—an unforgettable fable about a father's journey and a timeless guide to life's many questions. A knight, fearing he may not return from battle, writes a letter to his children in an attempt to leave a record of all he knows. In a series of ruminations on solitude, humility, forgiveness From Ethan Hawke, four-time Academy Award nominee—twice for writing and twice for acting—an unforgettable fable about a father's journey and a timeless guide to life's many questions. To ask other readers questions about Rules for a Knight, please sign up. Another self-help guide in disguise. But Ethan Hawke is, it must be mentioned, undeniably talented (dude's got not one but two writing Oscar noms. Two! [& two acting ones! =4 total!]). His words & phrases are tender, his examples almost rudimentary yet sublime. Almost. Also, it's a valuable testament of A Current Hollywood Actor's psyche. It would have made a much better tell all, with all the lessons to his children (on solitude, humility, gratitude, pride, cooperation, friendship, forgi Another self-help guide in disguise. This is a charming book for children that gives advice on how to be a good and noble person. I don't read a lot of children's books, but I saw this on display in the library and it was such a pretty edition that I checked it out. The story is that Sir Thomas Lemuel Hawke wrote this letter to his children in 1483, on the eve of a battle that killed him. Fearing he would never see his family again, Sir Thomas wrote adages and guidelines that could help them throughout their lives. (While the title This is a charming book for children that gives advice on how to be a good and noble person. I don't read a lot of children's books, but I saw this on display in the library and it was such a pretty edition that I checked it out. The story is that Sir Thomas Lemuel Hawke wrote this letter to his children in 1483, on the eve of a battle that killed him. Fearing he would never see his family again, Sir Thomas wrote adages and guidelines that could help them throughout their lives. (While the title is about being a good knight, the advice also applies to girls.) The letter was preserved over the generations and ended up in the care of Mr. Ethan Hawke, who said he had help translating it from the original Cornish. The advice draws from a variety of sources, including religious parables, literary quotes and famous speeches, and they are written in short tales designed to be accessible to children. At the end of the book the author acknowledges the "other knights" whose ideas were paraphrased, including Marcus Aurelius, Emily Dickinson, Ralph Waldo Emerson, Martin Luther King Jr., etc. Solitude: Create time alone with yourself. When seeking the wisdom and clarity of your own mind, silence is a helpful tool. The voice of our spirit is gentle and cannot be heard when it has to compete with others. Just as it is impossible to see your reflection in troubled water, so too is it with the soul. Grace: Grace is the ability to accept change. Be open and supple; the brittle break. Forgiveness: Those who cannot easily forgive will not collect many friends. Look for the best in others and yourself. Speech: Do not speak ill of others. A knight does not spread news that he does not know to be certain, or condemn things that he does not understand. Equality: Every knight holds human equality as an unwavering truth. A knight is never present when men or women are being degraded or compromised in any way, because if a knight were present, those committing the hurtful acts or words would be made to stop. After each introductory adage, which are accompanied by lovely illustrations of different birds, a longer story is told. While the tone of the writing isn't historically accurate, I appreciated the spirit of what the author was trying to do in making these knightly ideals more available to younger generations. The book itself is handsome, with an old-fashioned green fabric cover and a pretty typeface, and it's in that delightful pocket size that publishers used to commonly produce in the 19th century. I expected this to be a fun, fast read, but some of the stories were surprisingly thoughtful and I paused to reflect several times. This is a book I would happily give to my nieces and nephews. "There are only two possible outcomes whenever you compare yourself to another, vanity or bitterness, and both are without value." "Every knight has weaknesses. You will be no different. Where there are peaks, there will be valleys. You can be angry with yourself when you have disappointed, but let those feelings pass over and through you. Like a dead branch falling from a tree, which then decomposes and nourishes the soil, your disappointments can transform into the elements of change and growth." "As you grow into maturity, do not concern yourself with aging. A rose is striking in full bloom only because it will never be so again, but a budding rose is also stunning, as are the dark petals of autumn. It is the fact that time is passing that creates its preciousness. A preoccupation with aesthetic beauty can be a distraction that leads young people away from pursuing a sincere exploration of their inner lives." "There have always been two ways to be rich: by accumulating vast sums or by needing very little." "Often we imagine that we will work hard until we arrive at some distant goal, and then we will be happy. This is a delusion. Happiness is the result of a life lived with purpose. Happiness is not an objective. It is the movement of life itself, a process, and an activity. It arises from curiosity and discovery. Seek pleasure and you will quickly discover the shortest path to suffering." "You are not fragile. Engage. Being timid is often the result of being too self-critical and too self-concerned. A knight does not stop at each victory; he pushes on to risk a more significant failure." This is not the kind of book I typically read, much less buy. But on the weekend before Thanksgiving while in NYC, when getting ready to leave the Strand (not knowing I'd be there the next day too), I stopped when I saw this on a little stand. I picked it up and there was something I liked about its look and the feel of it in my hand. Or maybe I fell for the marketing: "Strand SIGNED Edition" a sticker trumpeted. It actually turned out to be an adequate transitional read for me. I was also drawn This is not the kind of book I typically read, much less buy. But on the weekend before Thanksgiving while in NYC, when getting ready to leave the Strand (not knowing I'd be there the next day too), I stopped when I saw this on a little stand. I picked it up and there was something I liked about its look and the feel of it in my hand. Or maybe I fell for the marketing: "Strand SIGNED Edition" a sticker trumpeted. It actually turned out to be an adequate transitional read for me. I was also drawn to most of the simple illustrations that lead each chapter, as they are all of different types of birds. This handbook for knights is a 6” x 4” hardcover bound with green cloth and a gold ribbon to place as you read. Hawke initially did not intend it for wide circulation: It was begun when his wife and he decided to have some “rules of the house,” which became more like “rules for living” the more he tried to think about what was really important to share with his children. The format and the content suit one another. Twenty chapter headings address key attributes or phenomena that face each person This handbook for knights is a 6” x 4” hardcover bound with green cloth and a gold ribbon to place as you read. Hawke initially did not intend it for wide circulation: It was begun when his wife and he decided to have some “rules of the house,” which became more like “rules for living” the more he tried to think about what was really important to share with his children. Hawke adds chapters on surprising things, like "Equality" (tawny owl), and his chapter on "Love" (mute swans) is heartfelt and personal. His chapter on "Death" (blackbird skull) shares a wisdom we can all use. "Life is a long series of farewells, only the circumstances should surprise us." In this small book we sense naked emotion and lived experience at the same time it is charming, and useful. Perhaps it is his actor's gift, to do that. Hawke’s stories are often not his own: he has chosen stories and lessons he learned from Native American myth, Buddhism, high school coaches, Bob Dylan, among others and has turned them to his own purpose. Hawke adds a list of those he considers knights at the end of the book, in which list we find the names of Julian of Norwich, John Keats, and Martin Luther King, Jr. along with Thich Nhat Hanh, Joseph Papp, and River Phoenix. In a New Yorker interview about this book, Hawke says that he learned just enough to entertain rather than be scholarly. I sensed that lack a depth just a little at times, but we can all use what he has collected. We can imagine how purposeful and meaningful it must have been for him to pull together the more constant precepts he has encountered in his life and to have pared them all down to a few short pages. Very satisfying indeed, and an admirable attempt. We may not always agree with what Hawke has chosen to highlight or his interpretation, but placing our thinking next to his raises his challenge. This collection is well worth the perusal for teachers, parents, novelists, poets as well as middle-graders and teens. "Never announce that you are a knight, simply behave as one. You are better than no one, and no one is better than you." "Expect nothing, and you will enjoy everything." "Jealousy, fear, and anger are obstacles to a knight's first goal: a clear mind." "Sometimes to understand more, you need to know less." A small book with good pieces of advice. Rules for a Knight is a quick and uplifting read. The premise of the book is a fictional letter written by a knight to his children in 1483 on the eve of a battle that would take his life. The letter provides a guideline for living an upright and virtuous life with anecdotes and pearls of wisdom. I would recommend this book especially for a young person. I like the story it went through all the aspects of what makes people good and decent and the background of how the story came to be is so interesting that I have to read it. I really liked it and it was an interesting read especially when it was a letter to his children on the eve of battle it was kind of sweet and beautiful. What a lovely book of life lessons. Each chapter starts with a quote about love, humility, death , justice and then backs it up with a story related to it. We also learn the story of Sir Thomas through these parables and how he came to be a knight.This book is full of philosophy useful for everyday life. Won in the First Reads giveaway. The writing was clear and lovely. It reminded me of The Alchemist. The illustrations were charming. Rules for a Knight was very sweet. I had experienced many of the parables before in either Buddhist or Christian teachings, but they are repackaged quite well in this small, green tome. I think that there will always be a place on my bookshelf for stories that teach about inner truths and the journey from apprenticeship to mastery. I also liked that the knight addressed himself to both his sons and his daughters. Probably not historically accurate, but I approve anyway.
" Rules for a Knight was very sweet. I had experienced many of the parables before in either Buddhist or Christian teachings, but they are repackaged quite well in this small, green tome. I think that there will always be a place on my bookshelf for stories that teach about inner truths and the journey from apprenticeship to mastery. I also liked that the knight addressed himself to both his sons and his daughters. Probably not historically accurate, but I approve anyway. Suitable bedtime reading for children of all ages who enjoy the reassuring irritation of being told how to be. Clichés done well enough to warrant multiple skimmings and at least one serious scrutiny. Collected cosmopolitan wisdom condensed into a single fabrication of a knight's rule (in Medieval life, monks first began to live by rules, as part of a tradition popularised by St. Benedict). It is most amusing that the promotional slipcover for this tiny tome contains a publicity still of the author Suitable bedtime reading for children of all ages who enjoy the reassuring irritation of being told how to be. Wow! For such a small book it sure packs a powerful punch... right to the heart. These "rules for a knight" can and should be rules for everyone. Profound, deep, thought-provoking, spiritual... definitely a book to ponder and read over and over again. This is really delightful. A nicely written musing on how to live a good life, suitably dexterous even when dealing with the huge matters of life and death. If I had kids, I'd happily read this with them time and time again, and it would probably help me as much as them. If I have one quibble, it would be that the medieval setting brings with it the distinction between knights and ladies. Even though the 'rules' are written in ways that can obviously apply to everyone, the illustrative narrative This is really delightful. A nicely written musing on how to live a good life, suitably dexterous even when dealing with the huge matters of life and death. If I had kids, I'd happily read this with them time and time again, and it would probably help me as much as them. If I have one quibble, it would be that the medieval setting brings with it the distinction between knights and ladies. Even though the 'rules' are written in ways that can obviously apply to everyone, the illustrative narrative tends to focus on the more exciting adventures and 'outdoor' roles of knight and squire - which undermines the author's assurances that ladies must be chivalrous, too. Ethan Hawke can obviously write. He'd probably see no need for it, but I'd love for him to give this another go and see if he can't take traditional gender roles out of the thing entirely. This book is bad. It's woefully anachronistic. The framing device is ham-fisted and nonsensical and smacks of an entitled self-importance on the part of the author that I don't care to speculate the origin of. The writing is of no literary value. The characters are flat and static. That's not even the worst part. There isn't a single original thought in this entire book. Every little parable is ripped off either from a religious tradition or the email-for If I could give this zero stars, I would. There isn't a single original thought in this entire book. Every little parable is ripped off either from a religious tradition or the email-forward zeitgeist. It not only retells stories that everyone has heard, it does so incompetently that does not do justice to the spirit of even the good tales it plagiarizes. Gisteren kon ik niet slapen. De volle maan straalde op mijn verhitte lijf, een hittegolf die 's nachts voortzette. Mijn hoofd was al even heet en kon zich niet ten ruste leggen. Ook al zat mijn week er op en kon ik mijn gedachten laten gaan. Ik kroop stiekem naar onze zolder, waar het lekker zwoel en donker was, knipte een lampje aan en begon te lezen hoe een edele jonkvrouw dient te leven. Meteen was ik in de helft. Het begon me te dagen dat Ridderschap en nobel leven altijd al van belang is ge Gisteren kon ik niet slapen. De volle maan straalde op mijn verhitte lijf, een hittegolf die 's nachts voortzette. Mijn hoofd was al even heet en kon zich niet ten ruste leggen. Ook al zat mijn week er op en kon ik mijn gedachten laten gaan. Een vader schrijft aan de vooravond van een veldslag zijn vier kinderen een brief, met daarin vervat de regels om nobel te leven. Dezelfde regels die hij op zijn beurt van zijn grootvader - waarvan hij schildknaap was - overgeleverd kreeg. Eigenlijk net als een hedendaagse overwerkte vader op zakenreis zou kunnen doen. Iedereen kan ten slotte plotseling 'geveld' worden. Iedere eeuw heeft daarvoor zijn ziekten en ongevallen. "Als jullie vader was ik aanwezig bij elk van jullie geboortes, en ik kan beamen dat in ieder van jullie iets magisch schuilt. Uit welke bron jullie leven ook is ontstaan, hij is diep, mysterieus, ongetemd en onbevattelijk. Ik heb er geen controle over, jullie evenmin. Sterker nog: we hebben maar heel weinig dingen in de hand, alleen onze keuze in de manier waarop we elke situatie aanpakken die zich voordoet. Vergeet niet dat sommige dingen zo mooi zijn, zo schitterend, dat er niet over gesproken kan worden, dat we ze alleen maar kunnen ervaren." Evenzo zal u het boek zelf moeten ervaren om de ridder in u aan te spreken. Hoe verder in het boek ik kwam hoe meer ik me een bekwame ridder begon te voelen. Mijn therapeutische idealen komen erg dicht bij deze beschreven voor de nobele jonkheren- en vrouwen. Met enige trots kon ik bij de epiloog dan ook vaststellen dat mijn trouwe Koning Carl Rogers vernoemd werd als één van de hedendaagse ridders waar het boek op gebaseerd was. Pluim dus mijnentwege voor Ridder Hawke. Wie was hij ook alweer? Ik moet hem googlen om te weten wie hij is. Acteur Ethan Hawke. De vader in 'Boyhood', geen goede film wat mij betreft overigens, maar wel weer één met een thema om u tegen te zeggen. Ook de 'Before'-reeks, dewelke ik graag binnenkort wil zien, staat op zijn palmeres. Laat ons dan maar concluderen dat ik duidelijk door zijn thema's wordt aangetrokken. Het boek is doorspekt met prachtige metaforen (De blauwe stenen mokken thee, de twee wolven in jezelf,...) Niet volledig onbekend, tonen dezelfde Ridders aan het einde van het boek aan. Hedendaagse ridders doen hun zegje in oude taal en liederen. Ieder hoofdstuk is voorzien van een prachtige vogel-tekening uit het Hawke-repertoire. "Laat je niet misleiden en laat je niet opjagen. Fouten maken kan altijd nog." The “sweaty-toothed madman” scene between Robin Williams and Ethan Hawke in “Dead Poets Society” is my favorite scene in any movie ever, so I went into Ethan Hawke’s new book with quite a bit of partiality. I was also drawn to it because he wrote it for his teenage kids, and I, too, am the parent of teenagers. The book is written as a letter of advice from the fictional Sir Thomas Lemuel Hawke to his children, and it covers such values as humility, pride, justice, courage, and proper speech. Bas The “sweaty-toothed madman” scene between Robin Williams and Ethan Hawke in “Dead Poets Society” is my favorite scene in any movie ever, so I went into Ethan Hawke’s new book with quite a bit of partiality. I was also drawn to it because he wrote it for his teenage kids, and I, too, am the parent of teenagers. The book is written as a letter of advice from the fictional Sir Thomas Lemuel Hawke to his children, and it covers such values as humility, pride, justice, courage, and proper speech. Basically, it’s everything a knight (or a human) needs to know in order to live an honorable life. I hoped the book would be something I’d want to share with my kids, and I thought it might have particular appeal to my D&D player. But alas, there’s no dragon-slaying in this book. I think my chess player might like it more. Having said that, I still intend to share this book with my kids. It teaches positive values that are consistent with Judaism, particularly the metaphor of the two wolves, but it’s not a religious book, so they’ll be more open to it than they would a mussar bichel. It’s also a short, fast read, and quite pretty, too, so it would make a nice gift, not just for teenagers, but for anyone. Animal rights activists will love the ballad poem at the end, and the list of knights was fascinating. I highly recommend it. ""Why am I alive? Where was I before I was born? What will happen to me when I die? Whatever well our lives are drawn from, it is deep, wild, mysterious, and unknowable..."Rules for a Knight is many things: a code of ethics; an intimate record of a lifelong quest; a careful recounting of a knight's hardest won lessons, deepest aspirations, and most richly instructive failures; and an artifact, a relic of a father's exquisite love." I really enjoyed this book. It was a pretty quick read and seeme ""Why am I alive? Where was I before I was born? What will happen to me when I die? Whatever well our lives are drawn from, it is deep, wild, mysterious, and unknowable..."Rules for a Knight is many things: a code of ethics; an intimate record of a lifelong quest; a careful recounting of a knight's hardest won lessons, deepest aspirations, and most richly instructive failures; and an artifact, a relic of a father's exquisite love." This book reminded me a good deal of Warrior of the Light by Paulo Coelho. Both books are more like manuals on how to live a "good" life than any kind of novel, but written in ways that don't come across as pretentious or preaching. In the case of Rules for a Knight, this is definitely a book I would like to own a physical copy of -- I borrowed this copy digitally from my library -- so I guess I've got a trip to the bookstore in my future. This book's message is the type of message people should look to. "There are only two outcomes when you compare yourself to another, Vanity or Bitterness, both are without value"
Beautiful book, beautiful gift, beautiful heritage to leave for one's children. Ein wunderschönes Werk über die Lehren des Rittertumd und ihre Aufgaben in der heutigen Zeit. My apologies multiple Academy Award nominee Ethan Hawke, "Rules For A Knight" just wasn't for me at this time. I say "at this time" because this book is very mood-specific for it to resonate with the reader, and I wasn't immersed in it. It sometimes gets a little preachy for my taste on some very basic common sense on humanity, and with each mini chapter structured around a certain quality, the narrative came across scattered and without purpose. Or perhaps I'll never be enlightened by it, which My apologies multiple Academy Award nominee Ethan Hawke, "Rules For A Knight" just wasn't for me at this time. I say "at this time" because this book is very mood-specific for it to resonate with the reader, and I wasn't immersed in it. It sometimes gets a little preachy for my taste on some very basic common sense on humanity, and with each mini chapter structured around a certain quality, the narrative came across scattered and without purpose. Or perhaps I'll never be enlightened by it, which by definition means I won't ever become a knight. Op de site van Ambo|Anthos staat te lezen: "Het boek speelt zich af in de middeleeuwen in Cornwall, waar sir Thomas aan de vooravond van een grote veldslag staat. Omdat hij voorvoelt dat hij de slag niet zal overleven, schrijft hij een brief aan zijn kinderen over twintig deugden die samen een kompas vormen voor hun reis door het leven: een kleine gids over datgene wat het leven zinvol maakt. Ethan Hawke baseerde deze brief met deugden als vergeving, moed, trots en geduld op oude wijsheden uit d Op de site van Ambo|Anthos staat te lezen: "Het boek speelt zich af in de middeleeuwen in Cornwall, waar sir Thomas aan de vooravond van een grote veldslag staat. Omdat hij voorvoelt dat hij de slag niet zal overleven, schrijft hij een brief aan zijn kinderen over twintig deugden die samen een kompas vormen voor hun reis door het leven: een kleine gids over datgene wat het leven zinvol maakt. Ethan Hawke baseerde deze brief met deugden als vergeving, moed, trots en geduld op oude wijsheden uit de Oosterse en Westerse filosofie en de grote spirituele en politieke teksten van nu. Leidraad voor een nobel leven is voorzien van illustraties: elke deugd wordt gesymboliseerd door een vogel, getekend door Ryan Hawke." This is a charming set of live lessons. The premise is that a knight is writing a letter to his children before he goes into battle. He is imparting his wisdom though 20 rules for a knight and then tells additional stories to illustrate the rules. This is a book that can be read in one sitting. The lessons are simple, but have a big impact. While none of the ideas are especially new and some are particularly modern, the premise and the writing make this short work very powerful. I highly recomme This is a charming set of live lessons. The premise is that a knight is writing a letter to his children before he goes into battle. He is imparting his wisdom though 20 rules for a knight and then tells additional stories to illustrate the rules. A quick, easy read with some ah moments but overall, basic knowledge and social etiquettes are shared with beautiful illustrations. I felt it was author's social commentary and wish for modern society. A nerd like me who has interest in knights (Jedis) and what we thought they stood for in the past - Chivalry and Honour will likely pick up this book. I just wish he made this into full on fantasy-fiction, then I might have like it more. Ritter Thomas schreibt seinen Kindern einen langen Brief am Vorabend einer entscheidenden Schlacht, in dem er ihnen Ratschläge und Lektionen in kleinen wunderbaren Geschichten lehrt. In 1988, Hawke was cast in a role in director Peter Weir's Dead Poets Society; the film's success was considered Hawke's breakthrough. He left school and appeared in A Midnight Clear, Alive, Reality Bites, Before Sunrise, Gattaca, The Newton Boys, Great Expectations, and many other movies. 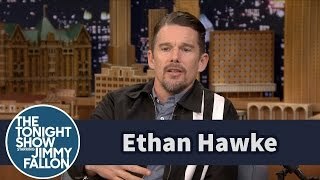 In 2001, he Ethan Green Hawke is a four-time Academy Award-nominated American actor, writer and film director.